Expanding into new export markets is a rewarding strategy for Canadian businesses. However, exporters often run into roadblocks along the way, including one of the biggest barriers to export success – finding and marketing to the right customer segments. Fortunately, there are exporting resources available to Canadian businesses that help make finding the right opportunities easier. Exporters should consider participating in trade shows as part of their international development strategy. These events help target the right customers in the right markets. This guide is meant to provide Canadian businesses with the tools and resources needed to find and evaluate high-quality trade shows and export events across the world. This is a first step in many export expansion projects and is also critical when accessing Canadian government funding to offset the costs of export market development. Businesses should begin the process of finding and evaluating trade shows by determining their ultimate objective of export expansion projects. Is brand exposure the main objective? Establishing contacts to support new sales? Understanding what outcome you want to achieve will shape the selection of events you wish to attend. Exporter Education: The provincial and federal governments will occasionally lead exporter education events, such as the popular New Exporters to Border States (NEBS) program that helps clarify what’s needed to export abroad. These sessions are an excellent way to align your business for exporting success. Search the Government of Ontario exporter education directory. Search the Government of Canada exporter education directory. Trade Event Directory: Includes trade missions and trade shows providing an opportunity for Canadian businesses to exhibit and make connections to foreign business executives. Search the Government of Ontario event directory. Search the Government of Canada event directory. As a leading directory for trade shows and conferences, 10times provides excellent insight into global growth opportunities for your business. Users can search for top export marketing opportunities within a few seconds, providing excellent visibility into the full range of events you may wish to participate in. 10times also maintains tailored lists of the 100 top trade shows in a country or industry segment. For example, businesses can easily search for the top 100 American trade shows, and the top 100 manufacturing and fabrication trade shows. Events in America is one of the most comprehensive databases of professional events and trade shows in the United States, and lists many Canadian-based trade shows, too. Business leaders can use the site to quickly look up trade shows by name, industry, or keyword (such as technology). This reveals an extensive listing of trade shows and events that are targeted towards Canada’s top trading partner, and helps you focus on the events most likely to spur your success south of the border. Export Trade Shows for Canadian Businesses: This resource is updated twice annually to profile the top export events worth attending. Streamline your exploration process by browsing these trade shows. By using the above trade show databases, you should be able to develop a large list of international trade shows and events worth attending. While this is a great start, companies should also be prepared to evaluate the opportunities each event provides. Not all trade events listed on these sites are worth attending, and your company should try to uncover the top two or three that can support your growth over the coming year. Each international trade show and event will maintain its own unique focus. As someone exploring new markets, it’s best to understand the market segments you want to tap into, as well as the type of leads you want to generate. These will help you focus in on the trade shows likely to give you the best results. Poor segmentation and lack of focus can lead to participation in trade events where very few high-quality leads are generated; by remaining focused on your target market, the likelihood of generating new export sales increases substantially. Most trade show and export event databases include historical data on past trade show vendors and/or attendees. If these resources do not include these figures, most event websites list how many vendors/attendees participated last time the event took place. Exporters should carefully consider these metrics to consider whether it’s well-attended and to examine the ratio of vendors-to-attendees. A low vendor-to-attendee ratio implies your business may receive greater exposure/have less competition at an event, whereas higher vendor-to-attendee ratios may suggest less value for exhibitors. One of the biggest factors for companies evaluating export trade shows is the overall cost to participate. While this is not always listed on databases or the event’s website, participation quotes can generally be received quite easily by emailing the event coordinator. Here, you can discuss booth requirements, placement, and inclusion in pre/post-event marketing materials. Another worthwhile calculation to perform is event cost per event attendee. This can be helpful when comparing large, costly events to smaller, more affordable ones. The calculation will help you understand the cost per potential lead generated and can uncover which events offer the greatest profit potential for the least investment. Finally, it’s always important to consider how much time your company has to prepare for trade shows and other exporting events. If there are only five weeks until the show, it may be difficult to register, prepare your marketing collateral, travel to the market, and participate to your highest ability. Taking several months to evaluate and prepare for these shows almost always leads to better outcomes for the business. Not only does this provide you the time to find and evaluate events effectively, but there is also time to prepare marketing materials and even tap into Canadian government funding programs. Developing markets through international trade shows is one aspect of export market expansion that every company should consider. However, the export process requires significant time and effort. 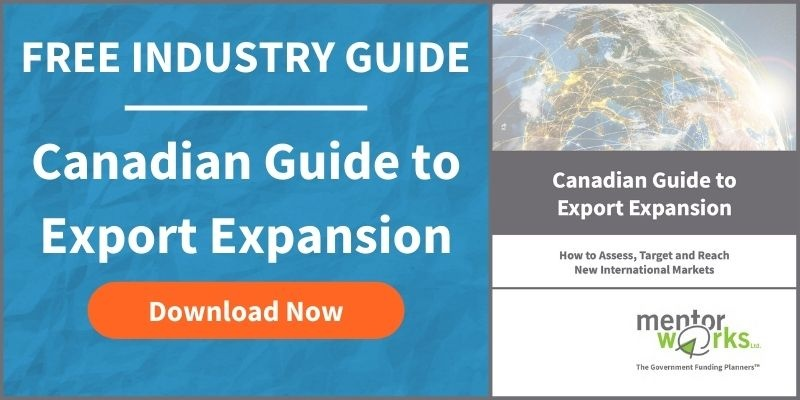 Fortunately, business owners and executives can download the Canadian Business Guide to Export Expansion white paper to learn more about topics ranging from performing market research, to financing export expansion projects. Download the Canadian Business Guide to Export Expansion to learn about more export market development strategies. Nice content.. its very helpful ideas are here in this article thanks for the sharing.. Thanks, Harvey! Glad you found this content to be useful!